To expect is human; we can’t get around it. We expect “X” value for what we pay. We expect a certain courtly experience from people we communicate with. We expect a level of professionalism from the companies we do business with. Depending upon where we set the bar, we can be either glaringly happy or utterly disappointed. Whether we realize it or not, outstanding design sets the parameters in place for guiding these expectations. From a visually outstanding meal set before us to a slickly-designed sports car, creative presentation has the power to set the mental bar. Some companies don’t take meeting-room design seriously, while others make random selections. What often goes unnoticed or unfulfilled is the power of design to position your company within a preplanned mental framework. 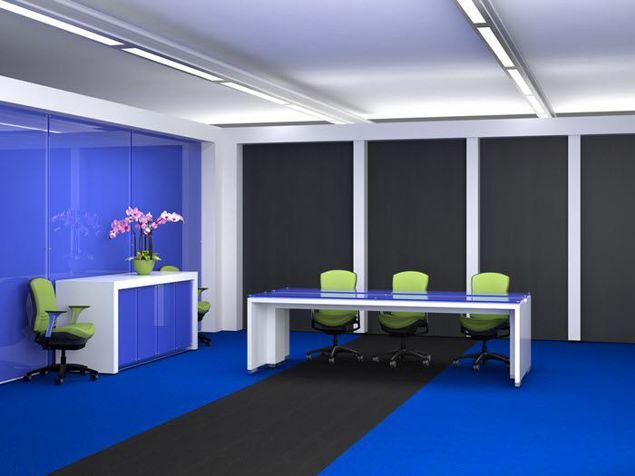 At 90 Degree Office Concepts, we believe your meeting-space design should be planned intelligently, to reflect key expectations your attendees will derive from doing business with your company. If your company has modern ideas, we have designed a conference-room table that could mentally raise the bar. We call it the Albuquerque. It has all the design detail one would expect to find in a forward-thinking company. 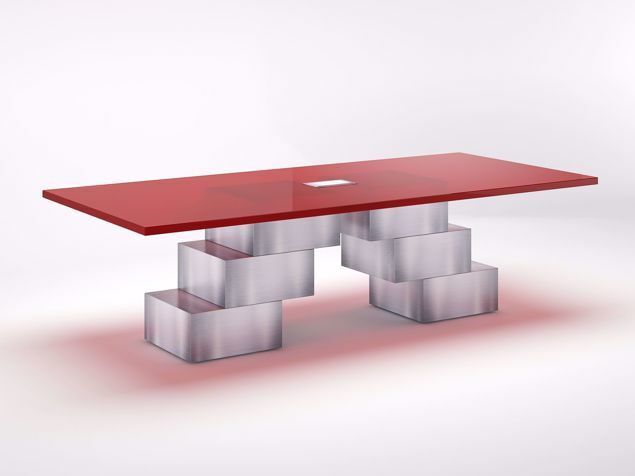 The Albuquerque Modern Conference Table has a powerful presence. Its top detailing is offered in an array of materials starting with entry-level/standard high-pressure laminate, and is upgradeable by category to specialty laminate, metals, and many species of wood veneer. Brushed aluminum garnishes the two-inch thick tabletop edge. 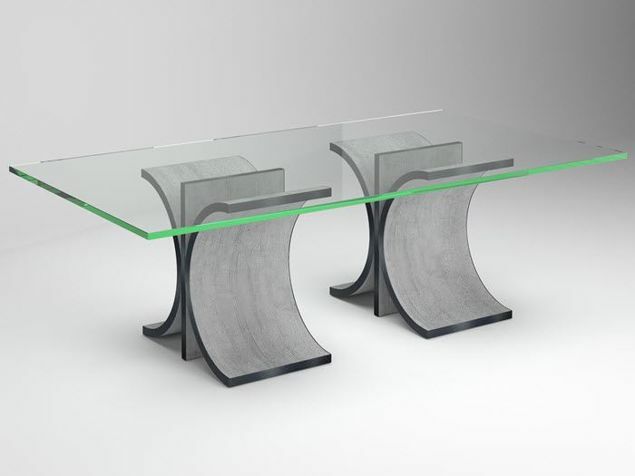 Its uniquely designed bases are offered in bi-color HPL choices, and can be upgraded to any color or type of metal, glass, stone, or wood veneer. The bases are a series of stacked geometric shapes organized to reflect a two-tone color combination showing both inside and outside coloration. 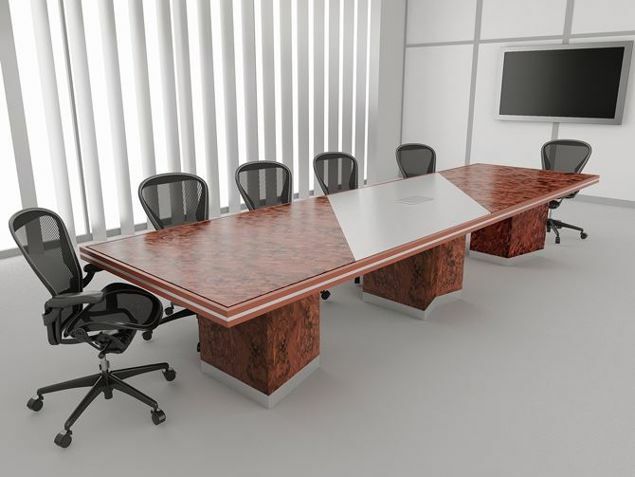 This modern conference table is designed and priced at 72" x 42", and can be changed to fit your room perfectly. Just ask your design consultant for any help you need to get the perfect fit. 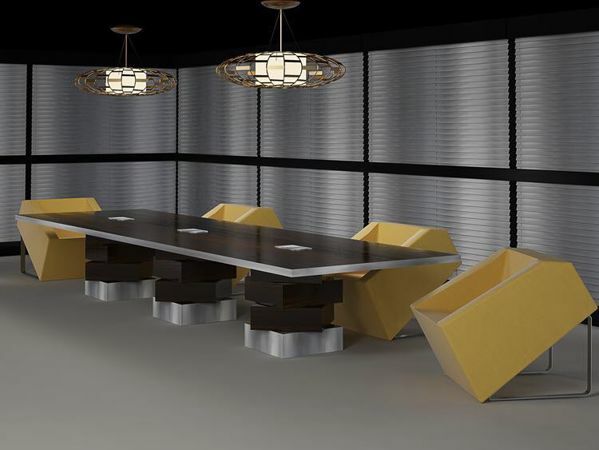 The Albuquerque Modern Conference Table shown here is sized at 192" x 48" x 31"H, and is designed with one of our designer laminates on top. The three bases are done in a brushed-aluminum exterior and matching gloss interior laminate. Features three flip-top grommets (power, data optional). Priced at: $4,634.